Achieving broad and sculpted shoulders takes consistency, dedication and the right exercises to hit the upper body from all angles. And while many women desire those toned shoulders that perfectly complement spring and summer clothing, many have trouble getting there. But it IS possible! You see, it all comes down to this— even when training gets tough, you’ve got to SHOULDER ON! To help us achieve this goal, IFBB Figure Pro Candice Keene is the perfect inspiration. Candice is a Figure International champion and a true training expert who knows exactly what it takes. Here she demonstrates an upper body-sculpting workout that includes some less-than-traditional exercises to help you change things up in order to see results. Not only will you rock your short sleeves when the warmer weather hits, but also having a set of beautiful, toned shoulders can make your waist appear smaller, giving your physique a more balanced shape. So come on, ladies— it’s time to SHOULDER ON! 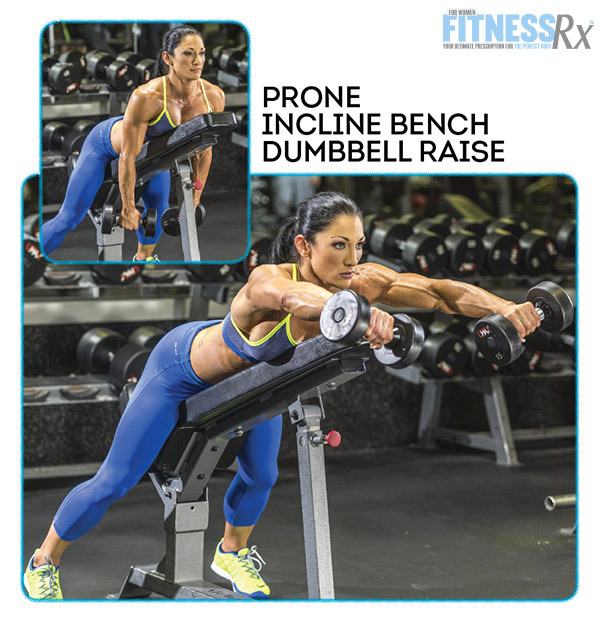 Begin seated on bench, and hold two dumbbells at your shoulders with your palms facing forward. Press the dumbbells above your head, and lower back to starting position. Hold a dumbbell in each hand and lie facedown on an incline bench. Slowly raise the dumbbells in front of you, and keep your elbows locked. Squeeze at the top and breathe out. Lower arms back down to your starting position and inhale. After performing the dumbbell raise, raise your arms to the side until your elbows are shoulder height and palms are facing the floor. Keep your elbows slightly bent. Return to the starting position. Hold dumbbells and stand with palms facing the front of the thighs. With a relaxing neck and traps, lift the dumbbells up to front of the shoulder, with elbows facing out. Sit on a bench holding a barbell with a reverse grip. Press the barbell upward and feel the stretch in your shoulders, and lower back down. Grasp the left cable with the left hand. Begin facing away from the cable machine, one foot in front of the other, slightly leaning forward. Slowly stretch the cables up, keeping elbows slightly bent, until your elbows are parallel to the floor and then slowly lower, all the while leaning forward slightly and making sure your stance stays staggered. Repeat with the other side. Attach rope on cable machine, set the cable to the highest position. Grasp rope, lean back slightly, and pull rope toward forehead. Repeat. Face and stand directly in the center of the cable machine, between the two stacks of weight. Set the cable to the lowest position or with just a few plates, and attach a rubber-grip handle. Begin grasping the left high-pulley cable handle with your right hand, and the right high-pulley cable handle with your left hand. Hold hands in front of your chest, elbows bent slightly, and pull the cables back in an arc until your elbows are behind your back. Bring your shoulder blades together, return and repeat. Get in a plank position behind an aerobics step. Then, step your palms up to a plank with both hands on the step and back down. Start in a plank on forearms, then place one palm on Bosu to press up to a plank, using both hands, and then back down to forearms. Candice shares her top tips. • Slow and controlled movements (no momentum/assistance from the body). 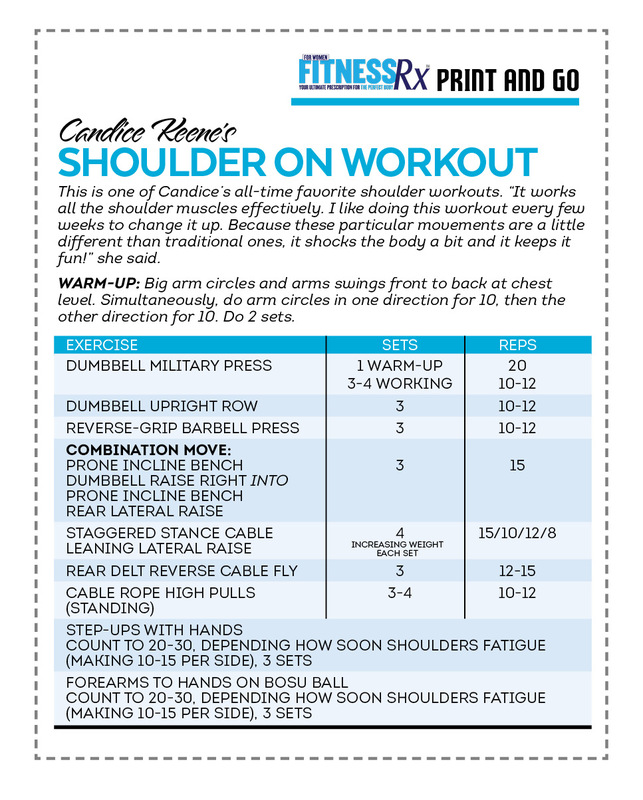 • Change up your shoulder routine often— keep those babies guessing! • Incorporate supplements into your diet plan. Candice’s favorites include BCAAs, creatine, ALLMAX’s Carbion (fast-digesting carb powder for post-workout), beta-alanine and ALLMAX’s Isoflex (clean isolate protein powder). Candice can be contacted for appearances through www.fmg-fitnessmanagementgroup.com.